Victory, victory, victory, says the Lord. 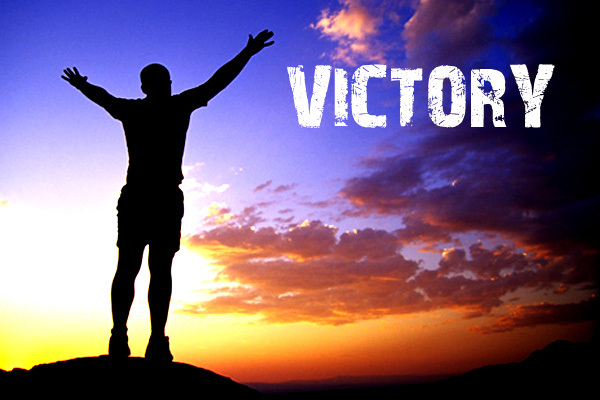 I decree victory, absolute victory for you in your life. You shall not be defeated. I have made you an overcomer. I have made you a valiant warrior. I have empowered you with My Spirit. You are not a fallen soldier. You are the undefeatable champion as I lift up your hand in Mine and declare that you cannot be knocked down or knocked out. There is no contest. There is no match, for nothing can harm you or disable you or destroy you, says the Lord. The fight has already been called, and you are the winner, says the Lord. When I said that no weapon formed against you shall prosper, that is exactly what I meant. I said none. None means none. I will defend you with the sword of My Spirit and Shield you on all sides. I Am with you to insure the victory. My armor is tested, tried and sure. My weapons can never misfire. There is never a dud or a failure in them. They are suoerior and unsurpassed and will overpower the enemy always.They always hit the taarget with a bullseye, says the Lord. Trust that you are fully equipped and ready and able to engage the enemy head on with fierceness and fearlessness, for the battle is already won, says the Lord.